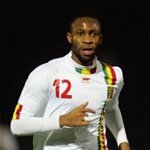 Seydou Keita was born in Mali on January 16, 1980. He is currently playing in FC Barcelona as an defensive midfielder, with strong aspirations for attacking. Throughout his career, Seydou has played in many clubs. His professional career begun in Olympic Marseille, where he played for a little while, and then he got transfered to FC Lorient. That’s where he learned a lot and became one of the best in his position. After playing in Lorient for 2 years, he moved to RC Lens. He was even a captain there. In 2007, his presence in France came to an end. He signed a deal with Sevilla and moved to Spain. In Sevilla, he caught the eye of the public and showed what a great footballer he is. Many big clubs were interested in him right away, but FC Barcelona the most. In the summer of 2008. Seydou signed a deal with FC Barcelona and thus became the first Malian player playing for FC Barcelona. He debuted in the Blaugrana in August, both in La Liga and Champions League. His contract with FC Barcelona expires in 2012. On international level, he is a standard member of the Mali national team.